Louisville, KY (RestaurantNews.com) Kentucky Fried Chicken® will reintroduce Kentucky Fried Chicken & Waffles to fans this month after an overwhelmingly positive response from customers during its debut last November. Available for just four weeks, the sought-after menu item will return to participating KFC U.S. restaurants from March 23 until April 29, or while supplies last. The waffles used for Kentucky Fried Chicken & Waffles were specially formulated to perfectly pair with KFC’s world-famous Extra Crispy™ fried chicken. They feature pearl sugar imported from Belgium, which adds to the golden-brown color and sweet and crunchy outer texture. 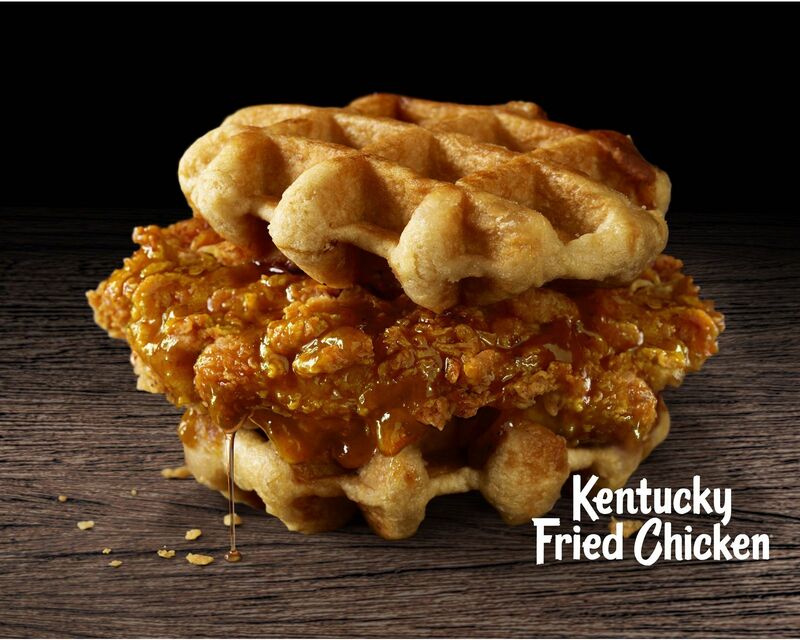 KFC went through at least 15 different variations of waffles before landing on the perfect one. The basket meal option, available as one-piece breast, two-piece thigh and drum or three-piece tenders, includes a delectable waffle alongside KFC’s famous Extra Crispy™ fried chicken and a sweet side of Mrs. Butterworth’s syrup for $5.49. The sandwich option features a KFC breast fillet nestled between two mouthwatering waffles served with Mrs. Butterworth’s syrup for $5.99 (also available as a combo meal for $7.99). For the hungriest chicken and waffles enthusiasts, Big Basket meals include two waffles and two syrups, with a choice of two-piece white meat, three-piece dark meat or four-piece tenders for just $7.99. Prices may vary by participating restaurants. KFC Corporation, based in Louisville, Ky., is the world’s most popular chicken restaurant chain. KFC specializes in Original Recipe®, Extra Crispy™, Kentucky Grilled Chicken® and Extra Crispy™ Tenders, Hot Wings®, KFC Famous Bowls®, Pot Pies, freshly hand prepared chicken sandwiches, biscuits and homestyle side items. There are more than 22,000 KFC restaurants in over 135 countries and territories around the world. KFC Corporation is a subsidiary of Yum! Brands, Inc., Louisville, Ky. (NYSE: YUM). For more information, visit www.kfc.com. Follow KFC on Facebook (www.facebook.com/KFC), Twitter (www.twitter.com/kfc) and Instagram (www.instagram.com/KFC).